Jurgen Locadia and Mathew Ryan starred as Brighton drew 1-1 in the Premier League with Arsenal this evening. Here's how James Wootton rated the players of both teams. Two great saves to deny Aubameyang in the first half. Albion are going to miss him when he goes on international duty. Looked bright down the right in the first half, did well against the pacy Arsenal attack. Marked his return to action after suspension with a traditional big defensive display. One of a few Albion players to be floored by Lacazette’s neat footwork for the opener. Proved a hard man to beat for the rest of the game. Some surging runs down the left flank. Growing in quality with every game. Some neat play and great vision to pick out some dangerous forward passes. Long through ball reached Locadia to set up Albion’s equaliser. Missed a great chance when he fired wide from six yards. Some good creative play in the first half, didn’t make as much of an impact in the second period. A good source of creativity. Wasted a great chance when he looped an effort over the bar when closing in on the Arsenal goal. 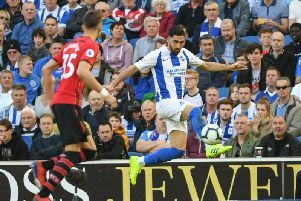 Almost equalised for Albion in the first half after bundling his effort over the line only for it to be ruled out for a foul on the Arsenal goalkeeper. Always a handful for the Arsenal defence. Didn’t put a foot wrong all game. Superbly took his goal when he latched onto Propper’s ball through before coolly evading Leno and prodding home into the empty net. Came close to a winner in the second half but dragged a shot wide. Almost wiggled his way through at the end but it wasn’t to be. Helped defensively as Albion looked to secure a point. Unused: David Button, Bruno, Gaetan Bong, Beram Kayal, Yves Bissouma. Not the most confident of displays. Had a lucky let off when the referee deemed a foul against Murray on the Arsenal keeper. Tried to exploit Albion down the right-hand side but Bernardo was more than a match for him. Made the mistake which led to Brighton's equaliser. Had a solid battle against Glenn Murray. Not the strongest of performances, Arsenal’s defence looked like they could have been penetrated every time Albion went forward. Had a good battle with Solly March down Arsenal’s left-hand side. Quiet game in the centre of midfield. Took the captain's armband after Koscielny was subbed. Saw a lot of the ball and controlled the tempo for Arsenal during the game. Lively performance, especially in the second half. Subbed at half-time, one of those games where the German went missing. Neat footwork inside the box provided Arsenal with the spark to take the lead. Subbed on the hour mark. Top quality finish to open the scoring, right footed curler into the top corner. Was also denied by two excellent saves by Ryan. Failed to change the game after coming on. Pacy threat down the right. Had an effort deflected just wide of the Albion goal. Unused: Petr Cech, Mohamed Elneny, Eddie Nketiah, Joe Willock.